Welcome to the future of Ordering Heating Oil. Sign up today for your SAC Energy Account and take your ordering experience into the 21st century. With a free account you can order, schedule, & pay for your fuel oil; view your past online orders; and get email alerts sent to you for storms, low prices, & more! The first step is to create your SAC Energy Account. This will be the home to all of your delivery sites and orders. Second will be to create your first delivery site that you'd like to order fuel oil for. You can add as many delivery sites as you’d like on your Account Dashboard. Lastly all there is to do is create the order! 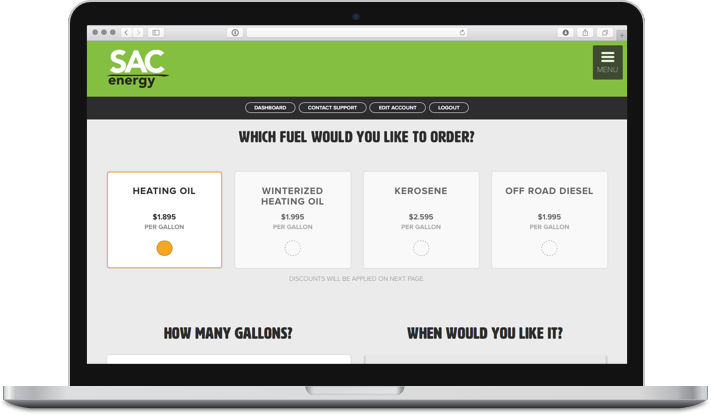 Follow the simple order form to select everything from fuel type to delivery date, then simply review your order and pay!